Keep your family safe and happy! We offer year round, no-contract scooping services to remove dog waste from your yard and deodorize problem areas to help keep an enjoyable, clean, and less smelly space. Price covers four weeks of service. Billing auto-renews at the start of week five. Discounts available to those with small yards. Discount will not be determined until after first visit, cannot be applied with another promotion. Start your serviceLooking for a one-time scoop? 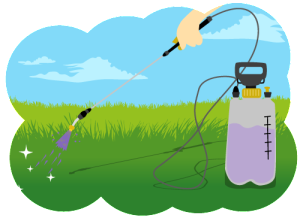 On each of your scooping sessions, we will spot deodorize – spraying a small area of your yard that we may find to have an unwanted “pet smell” – whether it be a section of gravel, patio, or a certain corner of your yard. Want a full application? Request a detailed, full yard deodorizing application for your next service date on this quick order form. It is $5 per application. What if I have more than 4 dogs? No problem! Fill out the start your service form and choose 4+ dogs. We’ll contact you shortly and send you pricing and a link to set up your billing information. What do you do with the scooped poop? We started a composting program in 2018, although only up to 30% of what we collect can be composted at this time. Rest assured that your dog’s waste will always be taken off your property to be disposed of so your trash can won’t have that unpleasant odor. Do you service my area and what would my service day be? We service Asheville and surrounding areas Monday through Friday – your service day will be scheduled depending on your geographical location. Note that an additional day will be added for those signing up for twice per week service. Get more answers on our FAQ’s page. Police Dogs and Service Dogs.